From many festivals that are celebrated in Lombok, the Male'an Sampi Festival of Lombok is a famous one that is celebrated with much so fun. The Male'an Sampi Festival of Lombok is unique for the reason that unlike other festivals, the Male'an Sampi Festival of Lombok is a power-charged game ritual. People have been known the Male’an Sampi Festival since 18 century in the government of Japan era in Indonesia. The name of the Male'an Sampi Festival of Lombok “Male'an Sampi” can be split into two Sasak words “Male’an” and Sampi”. 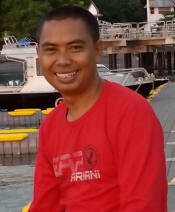 The word of “Male’an”means ‘chase’or as ‘to run after’ in Sasak, while the “Sampi” means ‘cow’. So literally the Male'an Sampi Festival of Lombok is a festival of cow race or, more broadly, ‘cattle race’. Held within the month of April, the race occurs after the harvest has been gathered and the farms are going through a rest period. During this time, the farmers and the cattle owners and stock breeders take advantage of the leisure to organize and host the Male'an Sampi Festival of Lombok. In fact, through the entire country of Indonesia, the Male'an Sampi Festival of Lombok is a special in this island. 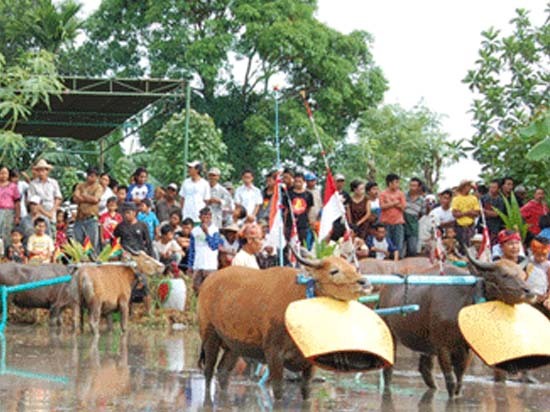 In this festival is especially for the ability control of two cattle completed with farmer equipment such Gau, Ayuga, Samet and Serumpungan or Kerotok. Before the race begins, the cattle that have been chosen by the owners with care. The cow is decorated to make it more interesting in the race. There is a procession of locals accompanied by music and fanfare. Some of the popular genres of music that accompany this procession are Tawak-Tawak, Gamelan Kampul and Batek Baris Lingsar. After all this, the race begins in the arena. The main arena comprises of a 100 meter long race track. However, it is not an ordinary race track, it is waterlogged. The cows that have been prepared for the race, with good food, grooming and a tiny dose of ‘black magic’ then take to the tracks. The winner and the good performers in the race get star ratings and are put up for sale by the owners as they are considered to be a good investment.